Cruise & Maritime Voyages has six ships in their fleet - Marco Polo, Magellan, Astoria, Columbus, Astor and Vasco de Gama. 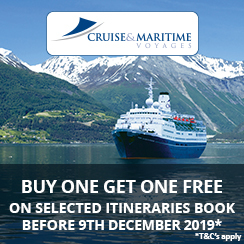 All Cruise & Maritime Voyages cruises depart from UK ports allowing you the additional benefit of not having to deal with the hassle of flights and airports. Cruise & Maritime Voyages have a distinctive British flavour to them and you will be able to enjoy a traditional English Breakfast on board. Cruise & Maritime Voyage's smaller sized ships, holding up to 1250 passengers, can reach those harder to reach ports of call which the bigger ships can’t get to offering you a rare look at those hidden gems. Marco Polo is an adults only cruise ship for those looking for a ‘child free’ holiday. There are many categories of cabin on board Cruise & Maritime Voyages ships but all cabins come with ensuite bathroom with shower, dressing table, storage, TV, safe and telephone as standard. From a traditional English Breakfast to a magnificent five course dinner your every meal is created with attention to detail with Cruise & Maritime Voyages. You will find both traditional British and international cuisine on the menu from a Sunday roast to a tasty seafood speciality. There are always vegetarian and healthy options on every menu as well as delicious desserts or cheese plates to end. Both formal dining and casual buffet style options are available with Cruise & Maritime Voyages depending on what you prefer on any given day, as well as afternoon tea, evening supper and the Captains’ Gala dinner. 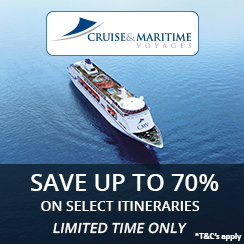 Cruise & Maritime Voyages pride themselves on the relaxing atmosphere onboard their ships. The entertainment team provide great shows for you to enjoy or you can dance the night away in the disco. Cruise & Maritime Voyages new Additions Programme includes Arts and Crafts workshops involving millinery, jewellery, mosaics, card-making and calligraphy. Guest and celebrity speakers on selected Cruse & Maritime Voyages cruises provide ‘An Audience with…’ talks about their lives, or enjoy some belly laughs in the ‘Comedy Corner’. Alternatively enjoy a game of bridge or backgammon in the library where the librarian can put you in contact with other guests with similar interests. All Cruise & Maritime Voyages ships also have on-board gyms, beauty salons, swimming pool for those who are looking to relax the body as well as the mind. Booking your Cruise & Maritime Voyages excursions before you set sail offers you peace of mind that you will be well looked after by reputable tour operators. Cruise & Maritime Voyages offer a wide range of excursions for every level of exertion, whether you are after a quiet sightseeing tour or something more physical and exciting. Shore excursion information is sent to you 56 days before you set sail, allowing you plenty of time to pick which excursion interest you most.